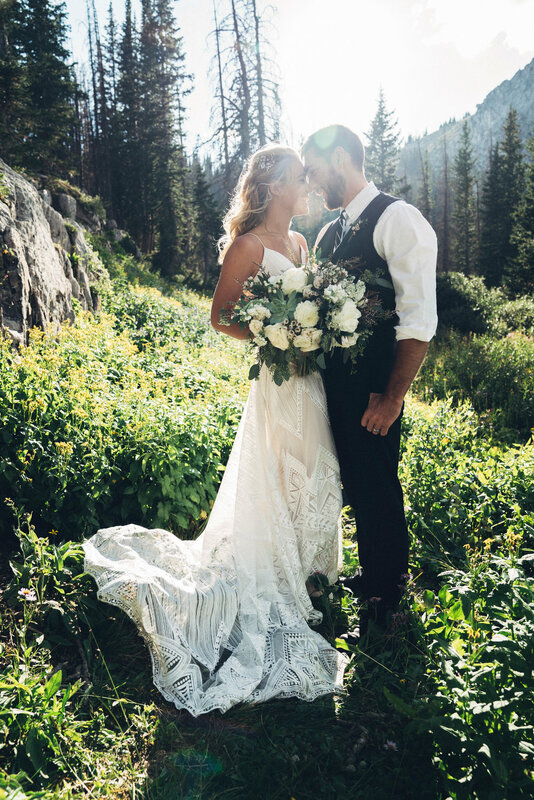 When Kevin and Audrey asked me to come to Wyoming to photograph their weddings I was excited. I love the state, wanted to explore its mountains more, and they seemed adventurous, kind, and outdoorsy - my kind of people. The opportunity to shoot the Stelzer+VanderBoon wedding proved to be a perfect and encouraging transition dedicating myself to photography as I turned down an opportunity to travel with another company. It was interesting because I'd never met Audrey and Kevin, but we are from the same hometown of Plainwell, MI. Audrey's sister Jess had attended a wedding I'd shot the summer before in Glacier National Park. The small world shrunk even more when I found out Audrey's family lives one street away from my mom's house. Audrey was a few years behind me in school so I didn't know her, and Kevin went to a different high school but they both assured told me they wanted to treat me like family - inviting me for the whole weekend, to the cabin they rented, and even on the river float the day after the wedding. The weekend contained a successful moose-search, many games of euchre, great food, the world's best coffee, an adventurously fun/stormy river float, and was highlighted by one of the most beautiful weddings I've ever been to. These two are the epitome of love in motion. The big day started with Audrey taking her bridesmaids into town for a workout before getting ready while Kevin led the men up to a peak over the cabin for a kettle bell workout. By 11:30 am everyone was back at the cabin. The guys were wrapping up brunch while Audrey snuck up into the bird's nest suite. She opened Kevin's gift to her - a bright green climbing rope she'd wanted for a while along with a note from her fiancé. The men were ready and left to decorate the venue by noon. I've stood in seven weddings, officiated three, and filmed a few and can say Kevin was excited, but also one of the calmest and sure grooms I've ever seen. He only moved to Wyoming a few weeks prior but pulled off the cowboy hat and mountain man persona already. The men left while the girls wrapped up in the bird's nest. Audrey's twin sister Megan was in charge of makeup and the bridesmaids laughed while listening to music before the father of the bride came in for a first look. Sun fell into the room for perfect light. Everyone was beaming as we loaded up the bouquets into cars and left for the hour long drive up to the hillside chapel. The ceremony was officiated by Kevin's grandfather inside a slightly slanted stone, mortar, and log open faced chapel with 30 or so friends and family on the rows of log benches. 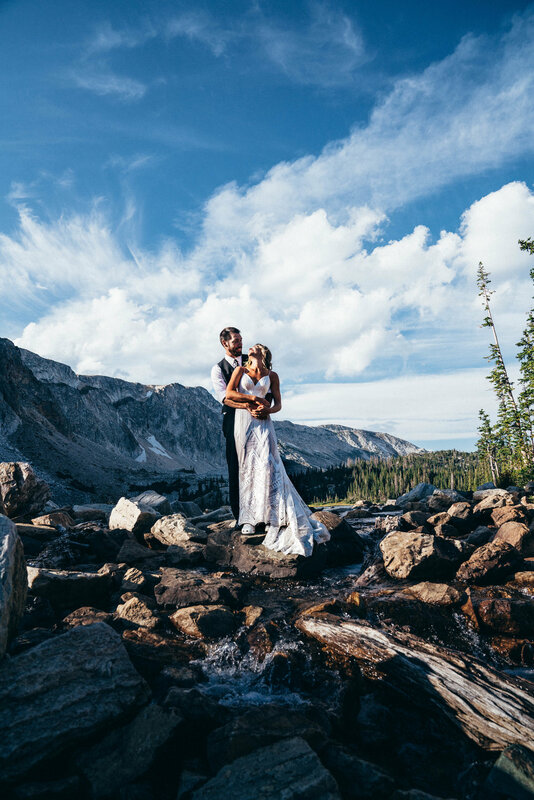 Nearly 360 views of mountains, a bright blue sky, and a grassy field made for amazing pictures right after the ceremony before we left for alpine lakes, perfect golden light, and a portrait shoot that could not have been imagined up any better. Kevin and Audrey were amazingly easy to shoot. They were so comfortable with each other and in their natural environment. The day before we visited this spot and Audrey and Kevin raced each other up opposite sides of the riverbed. They needed no extra encouragement to jump out on rocks along the lake and out on ridges. We found an amazing spot where sun peaked through the trees lit up Audrey's gown. I had to be conscious about moving on because every bit of light, stream, waterfall, and reflection was perfect. This is so cool. These two are so cool. Kept running through my mind. My favorite moments as a photographer come when it feels like the photos are just happening, I do not have to try too hard, and I realize I'm witnessing something rather than making shots happen. This was one of those days. We stopped off at one more pull off on the way to the reception. One last moment before friends and family, along a ridge that gave way to the expansive views and big sky Wyoming has to offer. I took a moment for myself there to think about what this day meant for these two, about their future, the adventures, the families, and felt pretty humbled to be a witness to such a thing. These two amazing people I'm lucky to now call friends joined each other and epitomized the reason why people call love an adventure. I'm just happy I was allowed to capture some of the beauty.